Scuba Diving and Liveaboards Phuket, Thailand » Blog Archive » Scuba Cat Diving, Phuket, Thailand was renamed Scuba Kitten for the day ! Scuba Cat Diving, Phuket, Thailand was renamed Scuba Kitten for the day ! 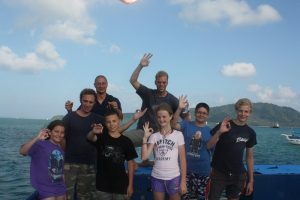 Yesterday the New divers on board MV Scuba Cat made all us instructors feel old! And not forgetting Ally O’Kearney who completed a Discover Scuba Diving with Scuba Cat for the 4th year, quite an achievement when you think she is only Age 12! This entry was posted on Monday, July 11th, 2011 at 9:04 am	and is filed under Diving for the family, Junior Open Water, New Divers. You can follow any responses to this entry through the RSS 2.0 feed. Responses are currently closed, but you can trackback from your own site.